This weekend the aisles of my neighborhood grocery store are crowded with colorful packages of candy and it’s flying off the shelves. The doors are hung with scarlet and gold banners bearing large Chinese characters offering good wishes for the New Year. For a week San Francisco will be celebrating the arrival of the Year of the Horse, and crowds of people will watch the big parade downtown. But while big cities along the coasts are well aware of the holiday smaller American communities may not even know it is going on. China sometimes seems the most foreign of foreign countries to those of us who live in the West. The language is difficult to learn, and the customs sometimes strike us as odd. That’s why there is a special thrill in discovering an individual who helps us cross the bridge and see what life looks like from a Chinese viewpoint. 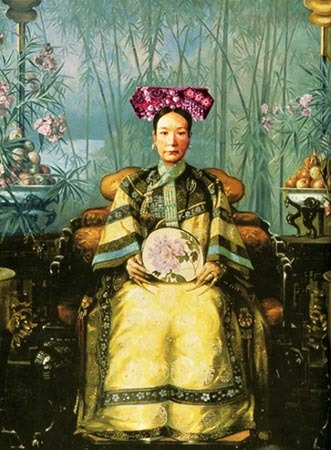 This week I have been reading Jung Chang’s Empress Dowager Cixi, which has given me a glimpse of what it was like to grow up in 19th century China. Cixi was born in 1835 while China was still isolated from most other countries. A few Europeans and Americans had visited China, but there was little trade between China and the West and even less understanding. Chinese leaders considered the Westerners to be barbarians and most Westerners scorned the Chinese as ignorant and backward. Cixi was destined to revolutionize the relations between China and the rest of the world. Girls and women at that time were not expected to play any role in public life. They existed to provide sons and heirs to their husbands. Cixi went to the royal court as one of many concubines for the emperor, but she had the great good luck to bear a healthy son. This changed her life. The emperor was sickly and because Cixi could read and write, she could help him handle his government duties. Doing this taught her a lot about government and how it worked. When the emperor died young, Cixi’s five-year-old son became emperor. Cixi was intelligent and politically astute. Her husband had appointed eight regents to govern the country while his son was a child, but Cixi knew she could do the job better. She allied herself with her husband’s childless wife and the two of them became guardians of the child emperor and effectively ruled the country. Because women could not be acknowledged as rulers, Cixi sat behind the royal throne, concealed by a screen, to listen to official reports and make decisions about what should be done. During the late 1800s, Europe and America because more aware of the valuable resources China had to offer to the world. Europeans and Americans, as well as the Japanese, competed to get access to natural resources and to the China trade. The struggle led to the Opium Wars and to many other battles. Cixi and some of her supporters recognized that in order to keep the country independent they had to accept some Western ways. Education was reformed so that young students learned more than just the classics of Chinese literature; representatives were sent to Europe and America and foreign diplomats were finally welcomed into the Chinese court. Cixi was by no means a perfect person; she could be cruel and impose harsh punishments and death upon her enemies, but she set the course of China toward modernization. By the time she died in 1908, China was ready to enter the twentieth century and take its place on the world stage. Now, more than a hundred years later, reading about the Dowager Empress Cixi gives us an idea of what a strong and powerful woman she was. Her determination and strength can help us to understand where China is today—a world leader. I strongly recommend reading Jung Chang’s book about the Dowager Empress. Always delighted to read about another fascinating woman who changed the course of history. Thanks for the reading recommendation. And Happy New Year! You definitely make me want to read that biography. It sounds fascinating! I’m glad you enjoyed the post. It must have been wonderful to be in China for the New Year ceremonies. I hope to do that someday. Oh this is awesome! We don’t see a lot of the Chinese New Year in South Africa, but I was fortunate to be in China last year as the Year of the Snake was welcomed. It was incredible, fun, and really overwhelming. I really liked reading about Cixi. I’ve always read a lot about China, but never this story. Thank you!